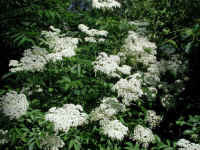 (Elderberry, American, Black, or Common (Sambucus canadensis L.) - 01) We have listed the three common names for this bush which can grow to heights of 10-12 feet: American elderberry, black elderberry, and common elderberry, depending on the reference sources we looked at. 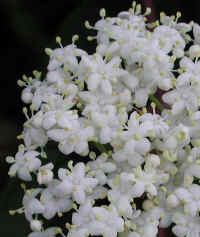 There also seems to be some disagreement in the scientific naming: some refer to it as Sambucus canadensis L., a native American species, while others classify it as a subspecies of the European elderberry, Sambucus nigra, Sambucus nigra spp. canadensis L. No matter what it's called, to us it is another one of God's beautiful creations for us to enjoy. 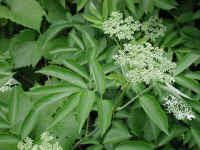 (Elderberry, American, Black, or Common (Sambucus canadensis L.) - 01a) The 6-11 inch long compound leaves of the common elderberry grow opposite one another on the branches. 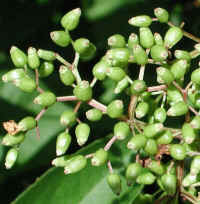 Each leaf can have between 5 and 11 elliptical or pinnate serrated leaflets (the leaves shown in the photo each have 7 leaflets). Leaflets can grow to lengths of nearly 4 inches, and can be nearly 2 inches wide, though most often they are smaller. 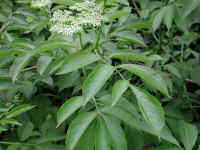 (Elderberry, American, Black, or Common (Sambucus canadensis L.) - 01b) The common elderberry begins to bud out in late spring with terminal cymes that are typically dome shaped or can be somewhat flattened. (Elderberry, American, Black, or Common (Sambucus canadensis L.) - 02) This is another look at some of the budding cymes of the common American elderberry. 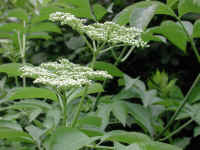 (Elderberry, American, Black, or Common (Sambucus canadensis L.) - 02a) The fully developed and flowering cymes of the common elderberry can grow as large as 10 or more inches in diameter. 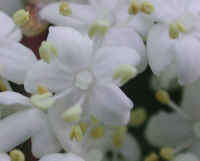 In the lower portion of the photo, we have a better look at some of the serrated edges or margins of the leaflets. 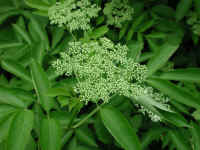 (Elderberry, American, Black, or Common (Sambucus canadensis L.) - 03) This is another look an the budding cyme of a common elderberry. (Elderberry, American, Black, or Common (Sambucus canadensis L.) - 03a) In this close up look at a common elderberry cyme, we can see that a couple of the buds are beginning to swell and are almost ready to open. To the lower left of the photo, we can see that the serration on the newly opening leaflets is much more pronounced. 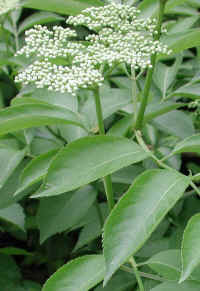 (Elderberry, American, Black, or Common (Sambucus canadensis L.) - 04) This is another look at the budding cymes of a common elderberry. 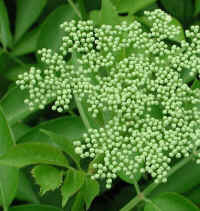 (Elderberry, American, Black, or Common (Sambucus canadensis L.) - 04a) This is another close up look at a budding elderberry cyme. 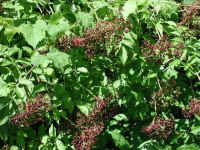 (Elderberry, American, Black, or Common (Sambucus canadensis L.) - 05) This is another view of a budding common elderberry bush. (Elderberry, American, Black, or Common (Sambucus canadensis L.) - 05a) The serration on these common elderberry leaflets is quite evident in this photo. We have also noticed that the serration is also more pronounced near the end of the leaflet, but not on the tip. And as we can see in this photo, a leaflet can also serve as a resting place for a visiting insect. 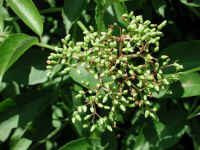 (Elderberry, American, Black, or Common (Sambucus canadensis L.) - 05b) This is another look at the common elderberry many flower bud that are in a cyme of a common elderberry. (Elderberry, American, Black, or Common (Sambucus canadensis L.) - 06) This photo gives us a good side view of the cymes on a common elderberry bush. (Elderberry, American, Black, or Common (Sambucus canadensis L.) - 06a) In this close up side view of a common elderberry cyme we can see the grooving in the flower stem. 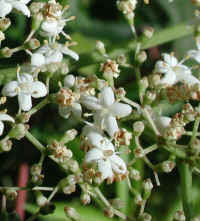 Near the top of the flower stem, it branches into four side branches and one central stem, which in turn branch again and again until there is only one flower bud at the end if each stem branch; the total of which makes up the cyme. 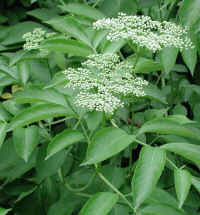 (Elderberry, American, Black, or Common (Sambucus canadensis L.) - 07) This is another view of a common elderberry. 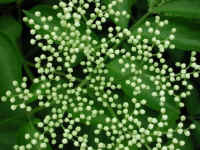 (Elderberry, American, Black, or Common (Sambucus canadensis L.) - 07a) This is a close up look at a couple of leaflets and a cyme on a common elderberry bush. 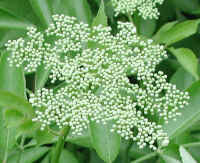 (Elderberry, American, Black, or Common (Sambucus canadensis L.) - 08) In this photo, we are looking down at a cluster of common elderberry flower buds. 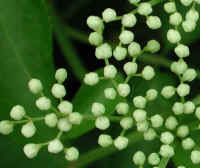 (Elderberry, American, Black, or Common (Sambucus canadensis L.) - 08a) This is a close up look at some of the common elderberry flower buds. 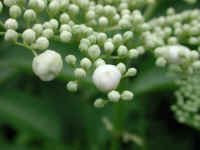 (Elderberry, American, Black, or Common (Sambucus canadensis L.) - 09) This is a photo of a couple of common elderberry flower buds that are just about ready to open. (Elderberry, American, Black, or Common (Sambucus canadensis L.) - 09a) This is a bee's eye view of some common elderberry flower buds, the larger of which is just about ready to bloom. 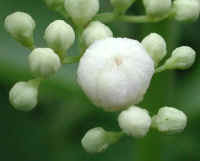 For size comparison, a fully opened flower is only 1/4 inch (4-5 cm) in diameter, and the large bud is less than half that size. 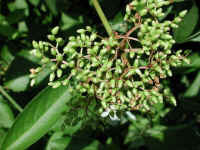 (Elderberry, American, Black, or Common (Sambucus canadensis L.) - 10) This is another look at some of the common elderberry flower buds. 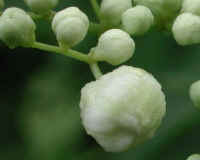 (Elderberry, American, Black, or Common (Sambucus canadensis L.) - 10a) This is another bee's eye view of a swollen common elderberry flower bud that is ready to open. (Elderberry, American, Black, or Common (Sambucus canadensis L.) - 11) The flowers on this common black elderberry bush are just beginning to open. 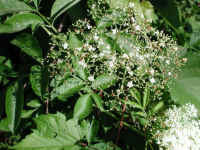 (Elderberry, American, Black, or Common (Sambucus canadensis L.) - 11a) When in the bud stage, the individual flower buds of the common elderberry are easily seen, even from several feet away, but once they begin to open into flowers, the cymes take on a white fuzzy appearance, and they have to be observed much more closely to see the individual flowers. 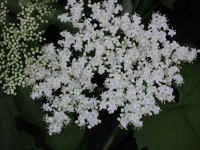 (Elderberry, American, Black, or Common (Sambucus canadensis L.) - 12) As we look closer at a flowering cyme of the common elderberry, we can begin to see the individual flowers. 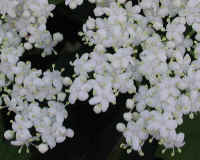 (Elderberry, American, Black, or Common (Sambucus canadensis L.) - 12a) As we look even closer at a portion of a flowering cyme of a common elderberry, we can see that the white corolla of each 5-6 mm (1/4 inch) flower has five lobes or petals. 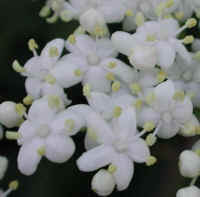 We can also see that each flower has 5 stamens. 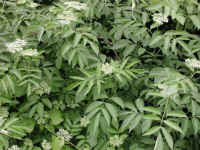 (Elderberry, American, Black, or Common (Sambucus canadensis L.) - 13) This is another look at the cymes of a common elderberry. 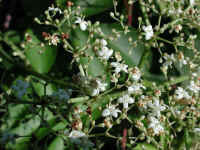 The partial one to the left is still in its bud stage, and the one in the center of the photo is mostly flowering. 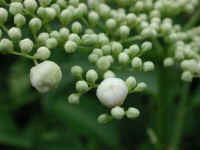 (Elderberry, American, Black, or Common (Sambucus canadensis L.) - 13a) This is a closer look at some of the swollen buds, and flowers on a common elderberry cyme. 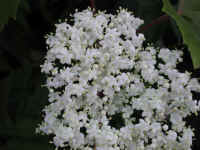 (Elderberry, American, Black, or Common (Sambucus canadensis L.) - 14) This is another photo of an elderberry flowering cyme. 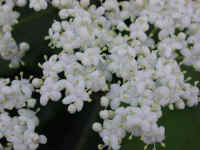 (Elderberry, American, Black, or Common (Sambucus canadensis L.) - 14a) In this close up photo of the common elderberry flowers, we can see that each flower has five petals, 5 stamens, and 1 pistil. 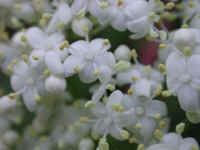 (Elderberry, American, Black, or Common (Sambucus canadensis L.) - 14b) This is another close up look at some of the common elderberry flowers. 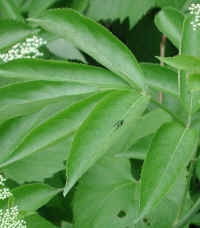 (Elderberry, American, Black, or Common (Sambucus canadensis L.) - 15) As we can see in this photo, the cymes of the common elderberry can grow relatively close together. 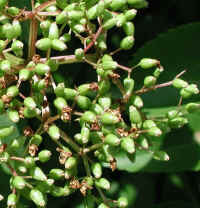 To the left of the photo, we can see a still green budded cyme partially overlapping the flowering cyme. 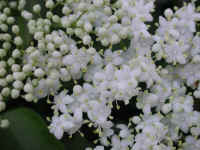 (Elderberry, American, Black, or Common (Sambucus canadensis L.) - 15a) In this close up photo of some of the common elderberry flowers, we can begin to see the 5-lobed stigma on the central pistil; however, we're not sure that every flower has a 5-lobed stigma, as we believe we have seen some with only 3 or 4 lobes. 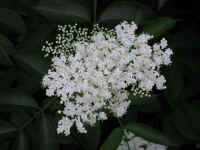 (Elderberry, American, Black, or Common (Sambucus canadensis L.) - 16) This is another photo of a flowering common elderberry cyme. 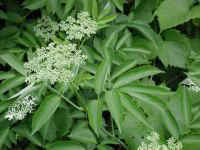 (Elderberry, American, Black, or Common (Sambucus canadensis L.) - 16a) This photo gives us a closer look at part of the common elderberry's flowering cyme. 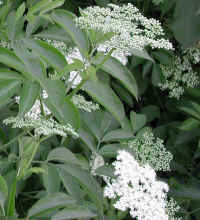 (Elderberry, American, Black, or Common (Sambucus canadensis L.) - 17) This is another photo of part of a flowering cyme of a common elderberry. 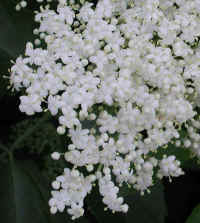 (Elderberry, American, Black, or Common (Sambucus canadensis L.) - 17a) This is another close up look at some of the common elderberry flowers. 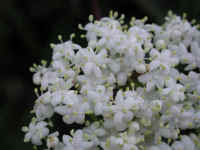 (Elderberry, American, Black, or Common (Sambucus canadensis L.) - 18) This is another close up look at some of the common elderberry flowers. 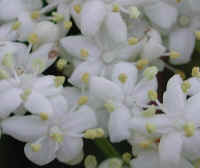 (Elderberry, American, Black, or Common (Sambucus canadensis L.) - 18a) In this bee's eye view of a common elderberry flower, we can see what we believe to be a 3-lobed stigma at the center of the flower, as we mentioned previously. 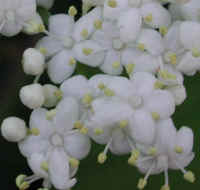 (Elderberry, American, Black, or Common (Sambucus canadensis L.) - 18b) In this bee's eye view of a common elderberry flower, the stigma appears to have 4 lobes. 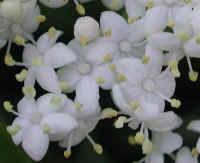 (Elderberry, American, Black, or Common (Sambucus canadensis L.) - 19) This is another close up look at some of the common elderberry flowers. (Elderberry, American, Black, or Common (Sambucus canadensis L.) - 19a) In this bee's eye view, we can see an unopened bud and one of the fully opened common elderberry flowers. 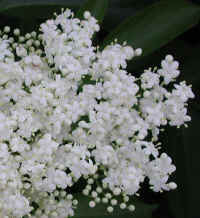 (Elderberry, American, Black, or Common (Sambucus canadensis L.) - 20) This is another close up look at some of the common elderberry flowers. 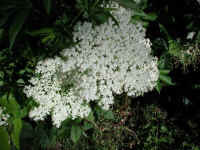 (Elderberry, American, Black, or Common (Sambucus canadensis L.) - 21) This is a photo of one of the larger flowering cymes of the common elderberry. 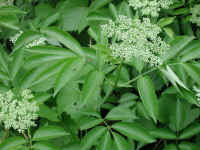 (Elderberry, American, Black, or Common (Sambucus canadensis L.) - 22) The common elderberry has various stages of development going on at the same time. 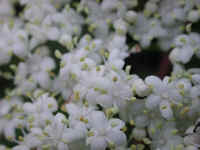 In the lower right we can see a partial view of a cyme that still has many unopened flowers, and in the center we have a cyme that has lost most of its flowers. 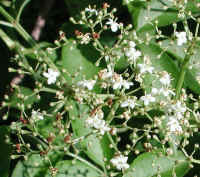 (Elderberry, American, Black, or Common (Sambucus canadensis L.) - 22a) In this photo, we have a closer look at part of the common elderberry cyme with its fruit just beginning to develop as the flowers fall off. 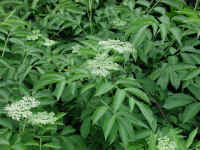 (Elderberry, American, Black, or Common (Sambucus canadensis L.) - 23) This is another look at a common elderberry cyme that is losing its flowers. (Elderberry, American, Black, or Common (Sambucus canadensis L.) - 23a) This is a close up look at some of the common elderberry fading flowers and developing fruit. (Elderberry, American, Black, or Common (Sambucus canadensis L.) - 23b) This is another close up look at some of the common elderberry fading flowers and developing fruit. 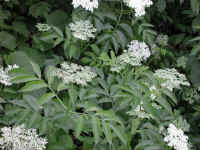 (Elderberry, American, Black, or Common (Sambucus canadensis L.) - 24) This is a look at a maturing flowering cymes of on a common elderberry bush. 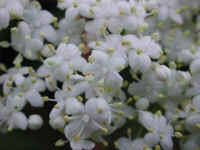 Some of the cymes have shriveling flowers. 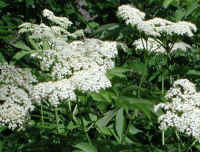 (Elderberry, American, Black, or Common (Sambucus canadensis L.) - 24a) This is a look at some of the cymes near the top of the common elderberry bush upon which the flowers are beginning to fade. (Elderberry, American, Black, or Common (Sambucus canadensis L.) - 25) The green fruit on the cyme of this common elderberry is beginning to swell. (Elderberry, American, Black, or Common (Sambucus canadensis L.) - 25a) This is a closer look at some of the green fruit of the common elderberry. 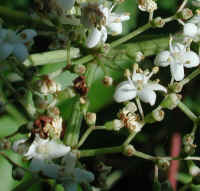 Previously to taking this photo, we assumed that each flower and subsequent fruit was on a single stem in the cyme, but as we can see in the upper left of the photo, one of the stems appear to have 3 fruit. (Elderberry, American, Black, or Common (Sambucus canadensis L.) - 26) This is another look at the green fruit on a cyme of a common elderberry bush. (Elderberry, American, Black, or Common (Sambucus canadensis L.) - 26a) This is a closer look at some of the common elderberry's green fruit. 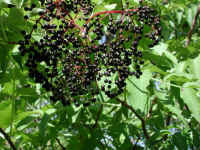 (Elderberry, American, Black, or Common (Sambucus canadensis L.) - 27) When the elderberry fruit ripens, it turns black. (Elderberry, American, Black, or Common (Sambucus canadensis L.) - 28) This is a closer look at some of the ripe elderberry fruit. 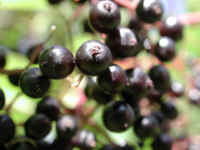 (Elderberry, American, Black, or Common (Sambucus canadensis L.) - 28a) This is a very close up look at the 3-5 mm (1/8 - 3/16 inch) diameter fruit of the common elderberry. 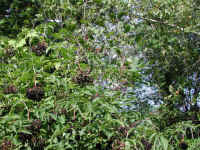 In this photo the color of the fruit could be considered to be a deep purple to black. 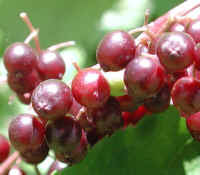 The fruit of the elderberry is edible, but the other parts of the plant are not, as they contain high concentrations of calcium oxalate. 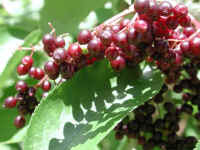 (Elderberry, American, Black, or Common (Sambucus canadensis L.) - 29) This elderberry bush is full of ripe fruit. (Elderberry, American, Black, or Common (Sambucus canadensis L.) - 30) This is another look at the clusters of mostly ripened elderberry fruit. 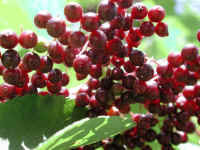 (Elderberry, American, Black, or Common (Sambucus canadensis L.) - 31) This is a closer look at some of the ripe elderberry fruit. (Elderberry, American, Black, or Common (Sambucus canadensis L.) - 31a) In this close up look at the sun lit elderberry, we can see some of the reddish tint still present in the fruit. Also note the light colored dots on the shiny surface of the fruit. (Elderberry, American, Black, or Common (Sambucus canadensis L.) - 32) This is another close up look at the nearly fully ripened elderberry fruit.